TALLINN, ESTONIA: Tallinn is the capital of Estonia which was formerly part of Soviets before 1991. Development of this city started since 13th century. This was one of the most important business trading place of Northern Europe in the 16th century. Unfortunately, fate of Estonia changed hands many times in the history from Danish to Swedish to Russian Empire to Nazi Germany, and back to Soviets until 1991, when it declared its independence without any bloodshed. Since Russian Empire ruled this country for 250 years and Soviet ruled it for 50 years, there are lots of Russian influence here and there. But this is the most successful country among the former Soviet countries. Just briefly on the city, Tallinn has over 400,000 inhabitants. Official language of Estonia is Estonian which is very similar to Finnish. Our guide was saying Estonia is the least religious country in the world according to BBC. 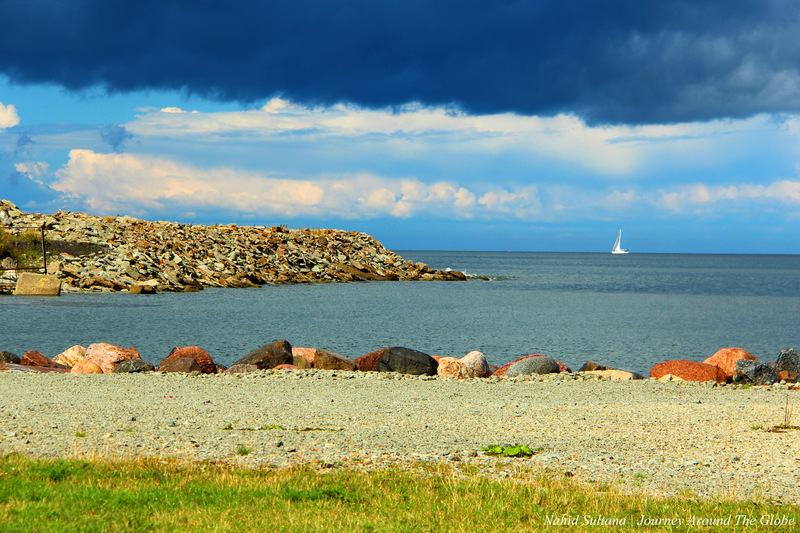 And Helsinki being so close to the city, less than 50 miles away, many Finnish people come here as day trippers. Our guide here mentioned few times how their economy, culture, and modernization boomed after they broke away from USSR. We went to Tallinn after visiting St. Petersburg in Russia. The picture here is completely different from what we saw in St. Petersburg. Tall glassy and shiny cube buildings and corporate offices are part of this bustling metropolitan city. Companies like Skype and Hotmail originated from Estonia. People are very hi-tech here with modern perception. FYI, almost the whole city of Tallinn has free Wi-Fi! The locals will tell you that it was a blessing for them that they are no longer part of Soviet. Saying above, Tallinn still kept its Middle Age alluring and pleasing atmosphere in the old part of it. This section developed somewhere in the 15th century. It is astonishingly very well-preserved and very energetic. It is enlisted in UNESCO World Heritage Site for significant historical background. By the way, this is where marzipan was invented…though I really didn’t find anything with it in the stores. We toured around Tallinn with a guide from SPB Tour in a small group. My husband booked a package online thru this company for Warnemunde/Rostock, St. Petersburg, and Tallinn. The whole thing cost about $1200 (+ 15% tips to the guide) for all four of us. 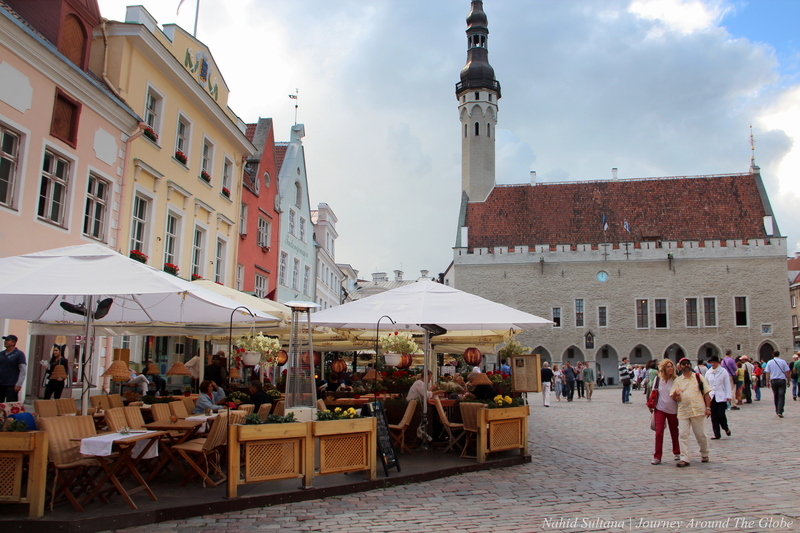 TIME of TRAVEL: Tallinn was penultimate stop in our 12-day Baltic Cruise that we took in August of 2013. We drove to Calais, France from Belgium, took ferry across English Channel, and started sailing from Dover, England. It was a bit chilly and started to rain really badly towards the end of our day in Tallinn. But most of the day was very sunny and pleasant. Not sure where that rain popped up all of a sudden! EATING and SHOPPING: Although we didn’t really try any Estonian food…we had some quick sandwiches from McDonald for lunch. But there were many lovely restaurants with outdoor sitting everywhere in the old town, especially in Lower Town. Food here supposed to be very close to German and Russian. Juniper tree coasters and boxes are very common in Tallinn, just like Helsinki…may be a common Baltic thing. Amber is also very popular and we saw cluster of amber jewelry and décor stores in Upper Town. But our guide in Tallinn told us that these ambers are not really anything Estonian origin. For amber, Riga (in Latvia) is the way to go. You can also get very nice and warm winter coats, sweaters, and accessories here… may not be cheap but definitely good quality. Estonian white chocolate with blueberry was another unique thing that our guide mentioned…but I couldn’t find it anywhere. Lower Town, especially near Viru Gate, is loaded with many indoor stores and outdoor vendors. My husband bought me a nice thick knee-high sweater from one of the stores near our port terminal. 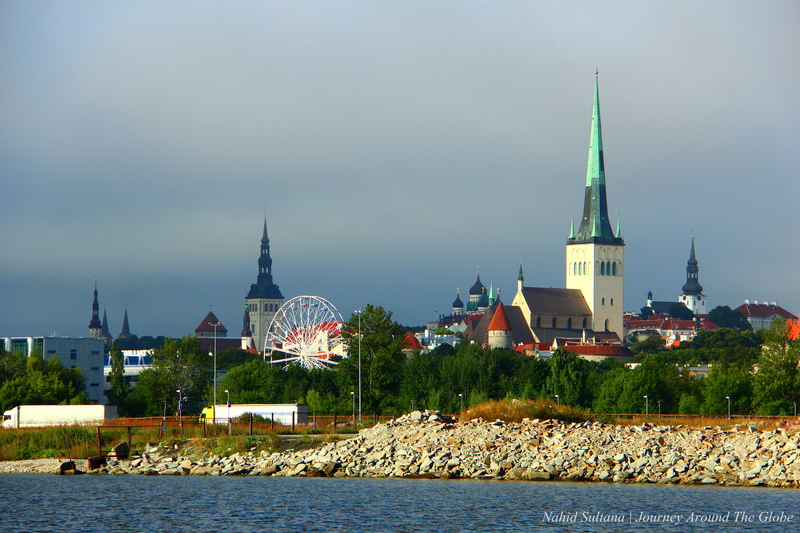 PLACES WE’VE VISITED: We got the chance to see Tallinn only for few hours. After visiting St. Petersburg, I really had very less expectation from Tallinn. But boy was I wrong. And our tour guide lady made this visit even more knowledgeable and fun. Medieval Tallinn is divided into two parts – Upper and Lower. Our tour bus took us to the Toompea hill (The Upper Town) first and it ended at Viru Gate in the Lower Town. If I could spare some extra time, I would love to go to Ex-KGB Headquarter. This is where they interrogated and tortured suspects. Although this is not open to the public now, but you can go and visit its exterior. Medieval old town of Tallinn is very compact and best to be explored on foot. 1) TOOPEA HILL or UPPER TOWN: About 60m above sea-level, Toompea Hill was once the historical heart of the city. This is where the Danes once made their castle in 1219. In 1710, the ownership of Toompea was changed from Swedish to Russian Tsar Empire. Upper town used to be the dwelling place for rich and wealthy citizens of Old Tallinn. 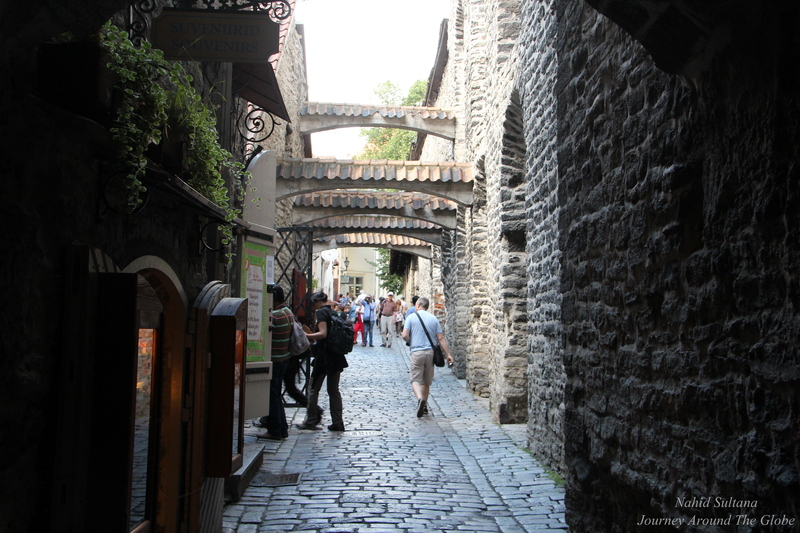 Cobbled streets filled with medieval houses and alleyways make this place a medieval charm. Upper Town can give you a beautiful panoramic view of the Lower Town, its towers, steeples, and picturesque red-tiled roofs. a) ALEXANDER NEVSKY CATHEDRAL: Our tour started with this impressive Russian Orthodox Cathedral of Alexander Nevsky. This is the oldest public building to have been erected in Toompea. It is a Russian Orthodox Church and therefore doesn’t really resemble Estonia’s typical local architecture. But gotta love the onion domes on the top. Built in the style of the churches of 17th century Moscow, its interior is full of pretty mosaics. Like any other Russian Orthodox churches, it doesn’t have any seating arrangements or a nave. But it has a gorgeous altar with portraits of saints. The present façade was constructed fairly recently in 1922. If I can remember correctly, I think our guide mentioned that it is still maintained by the churches of Moscow. It’s free to enter but since this is still an active church we weren’t allowed to take any picture inside. b) PARLIAMENT (RIIGIKOGU) and OLD TOWERS: Right opposite of Alexander Nevsky Cathedral is Estonian Parliament. It’s a pretty pink building which once used to be a castle, Toompea Castle, in the 13th century. Two towers out of the original four still remain. c) DOME CHURCH or CATHEDRAL of ST. MARY THE VIRGIN: Through the cobble-stoned lanes of Upper Town we reached a Lutheran Church (originally a Catholic church), known as Dome Church. It’s the oldest church in Tallinn, originally built 780 years ago but the present building was constructed in 1224 by the Danes. It was changed to Baroque style in the 18th century. It is the only one of Tallinn’s medieval churches that is still active. Many local famous people were buried inside the church. In the medieval time many noble families had their own coat of arms and 107 coat of arms of some of such noble Estonian families still hang on the walls of this place. 2 euros to enter the church. In front of the church is the crossing point of eight streets in the middle of Toompea Hill. d) THE VIEWING PLATFORMS: The Viewing Platform is one of the places tourist ought to visit in Tallinn. Most of the old town can be monitored from the edge of the Toompea Hill where the platform is located. You can see the Baltic, red-tiled roofs, some important landmarks, old city wall, and defense towers from up above. This beautiful and romantic place makes you wonder about the ancient time and legends lost in centuries. 2) LOWER TOWN: After we were done with Upper Town, it was time to go down. We descended from Toompea Hill to visit the sites in Lower Town, the central intersection of the town’s network of cobble-stoned streets and alleys. 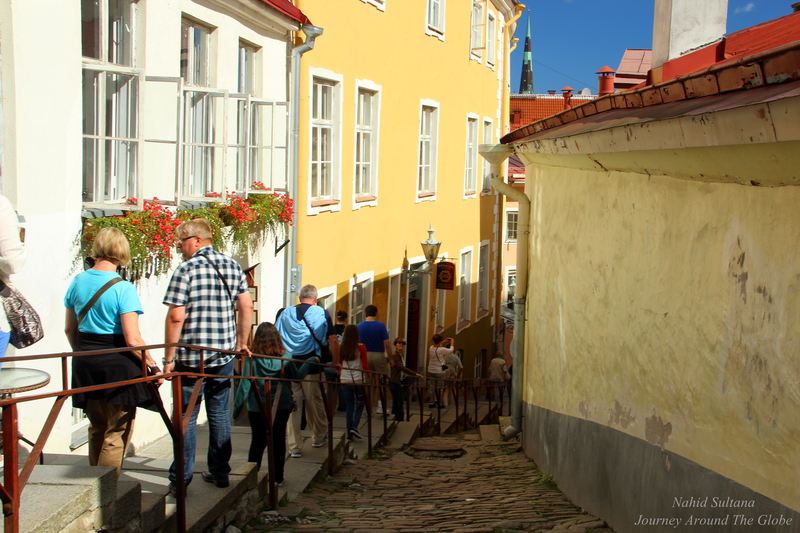 There are two ways to go down to Lower Town from Toompea Hill. An old wall separates these two places. We took the short leg, which runs parallel to long leg but has steps and is much steeper. Lower Town spreads out from foot of the hill and is still protected by the remnants of a city wall. Lower town used to be the place for common men, merchants and shoppers in Old Tallinn. There was a distinct division between the Upper and the Lower Town back then and hence the wall with gates were constructed to separate the two parts. This gate used to be closed after sundown back in the old days. a) ST. NICHOLAS CHURCH: German merchants started construction of this church in 1238 dedicating it to St. Nicholas – protector of businessmen and sailors. It’s not a working church, just a museum now. We didn’t go inside it, but this old building sure was marvelous. b) CAT’S WELL: The legend about this well in Lower Town goes that a horrible spirit dwelling at the bottom of this well. It was said that the spirit would flood the entire city if an occasional sacrifice in the form of dead cats was not brought. c) OLD MARKET PLACE: This was once used to be the main square during medieval time in Lower Town for the common man. A ring of cafes and shops now make this a cool place to hang out and do a little shopping. d) TOWN HALL SQUARE or RAEKOJA PLATS: This was the heart of medieval Tallinn and still maintains that charm. It’s been a meeting place for the local for centuries. This is where people met for town meetings, celebrations, and receptions in the old days. It’s a big square with many old buildings, cafes, and shops. Also, interestingly, The Town Pharmacy of Tallinn the oldest working pharmacy in Europe from 1422 is also located here. Town Hall Square is dominated by the town hall (of course) from 1371, which looked bit like a church to us with its spire. The present stone façade is from the 15th century and this is the only Gothic style town hall in whole Europe. We got a glimpse at this impressive architecture just from outside. It now houses Tallinn City museum and is open to the tourists. e) ST CATHERINE’S PASSAGE: This romantic old passage, connecting two streets, hosts many private artists’ studios. Along with that we saw a collection of 14th and 15th century medieval tombstones, located next to the old Dominican monastery. 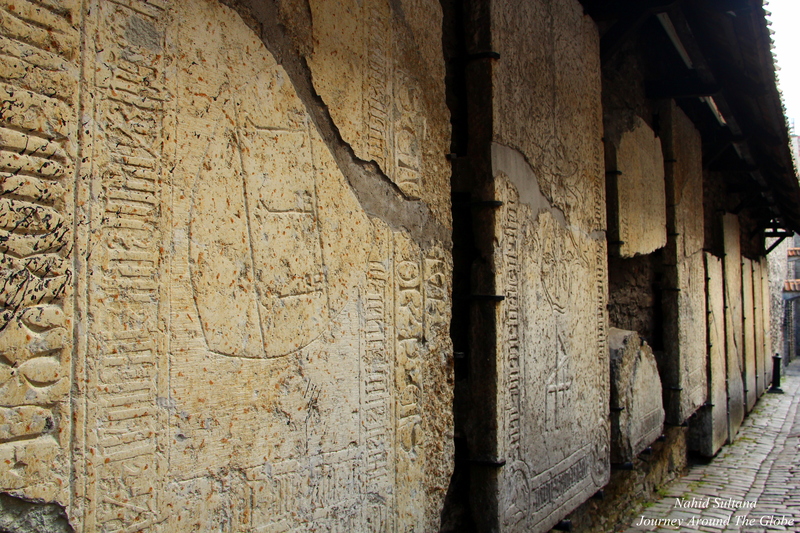 These tombstones are from the Church of St. Catherine of Alexandria and in the mid-19th century the best preserved ones were displayed on the wall. Don’t miss this passage when in Tallinn, it was very charismatic walking thru that narrow alley with small bridges on top of our heads. 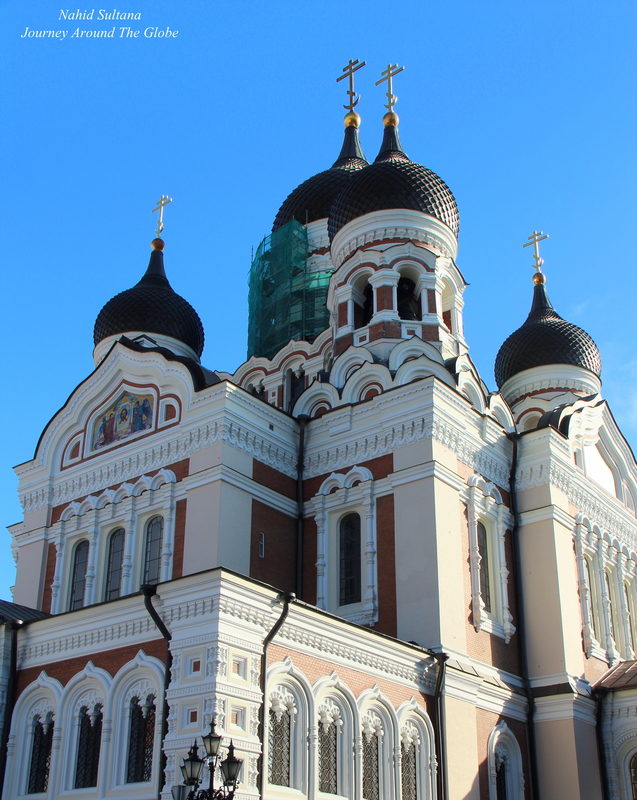 f) ST. OLAV’S CHURCH and TOWER: This church with its high spire was built when Tallinn was still a small port city. g) VIRU GATE: Our tour ended visiting the fortifying walls and towers that surround the city and which in the 16th century made Tallinn’s defense system one of the best and most powerful in Northern Europe. This is one of the two front gates of Tallinn left today from the 15th century. It has been repeatedly built throughout the centuries. But the adjacent buildings are relatively newer from the 19th century. Visitors can walk on the rampart of this wall for better view for 3 euros. Very nice post! Estonia should be really fantastic! What a great country with historical and technological all wrapped up in the same place. Was surprised to learn that Skype and Hotmail were located there. No wonder they have free WI-FI for everyone.